This entry was posted in Slides and tagged 23, 5023, Electro-Motive Division, F7A. Bookmark the permalink. Train is northbound (geographic west) on the Memphis Subdivision. At this point the train is running along ”Broadway” a multi-track east-west corridor of tracks between the Mississippi River bridges to the west and K. C. Junction to the east. Broadway provided access to the major depots, freight houses, yards and interchange points scattered across Memphis. At K. C. Junction the railroads diverged on their own routes to the northeast, east and southeast. The train is just crossing under signal bridge A, the west approach, of the Memphis Union Station (MUS). MUS was used by the Louisville and Nashville (L&N), Nashville, Chattanooga and St. Louis (NCSL) St. Louis, Iron Mountain and Southern (SLIM&S) or Missouri Pacific (MP), St. Louis and Southwestern (SLSW) or Cotton Belt and Southern (SOU). It was a stub end depot that sat to the north of the tracks. The diamonds and tracks in the foreground are the I.C. 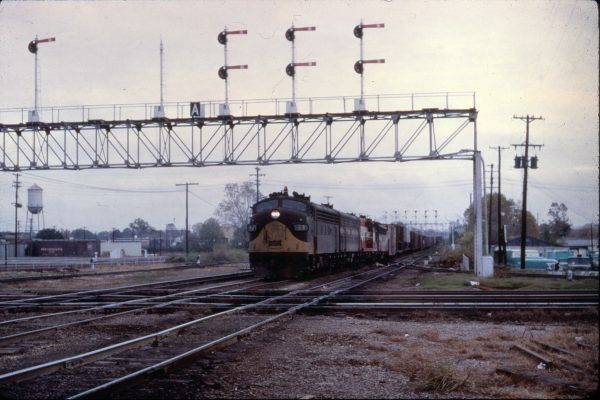 (Illinois Central) Crossing, at MP 483.8. This crossing is just south of Memphis Central Station (MCS), MP 484.4. MCS was used by the IC, Rock Island (RI) and Frisco. RI and Frisco trains would pass this point and back to the north into the depot. They would then depart heading out in the appropriate direction of travel. Most IC trains passed through MCS depot’s tracks that ran on a north-south axis. Visible in the distance above the train is signal bridge B. It is located at Tower 17 just south of MUS. Further east is signal bridge C, the east approach. Signal bridge D is located to the north of Tower 17 at the throat of the MUS depot yard tracks. Tower 17 controlled the plant into MUS and the NC&SL Main Street or “Inside” Yard immediately to its west.